Published by Atlus U.S.A. / Atlus U.S.A. / Atlus U.S.A. Promotional CD produced by Atlus for North American release, was issued to customers from certain retailers with pre-orders of the game. Disc includes CD-ROM content such as desktop wallpapers, music sheets and promo video. 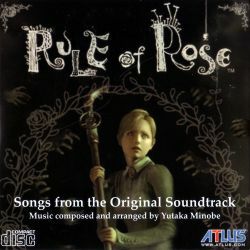 "A love suicide ~The theme of RULE of ROSE~"